Does it take a week to replace a hard drive? We all went out for a belated Mother's Day this weekend and had a fun time. My mom got some new shoes and we had a nice dinner at the Black Cow in Newburyport. We got there at 3:00, but they closed the restaurant for an hour to get ready for dinner. So we headed over to the bar and enjoyed some nice cold beers, then ordered dinner in the bar. No update from Apple on the status of the repair. They've had the computer for a week now. That's a lifetime in blogging circles. Hi again. Steve here sitting in for my mom. I called the Apple Store to get a status on my mom's iBook repair. I was transferred to AppleCare, and a friendly computer answered. She wanted to know my Repair #. So I told it to her and she understood it. Smart computer. After a few more button presses, I was talking to a real person. She informed me that my mom's computer was backed up at the Apple Store and that it was currently being looked at in the service department. That's cool. My mom just sent it in yesterday. I'll be able to check the repair status online at Apple - Support - Repair Status. When my mom gets the computer back, she'll be able to take it over to the Apple Store and they'll restore her data. I like that plan. Saves me from having to set up all her email and browser settings. So now my mom is off to that photo workshop for the afternoon and then has plans for a Mah Jong game tonight. She's heading to the library tomorrow to check her email. My mom just called to tell me that her Macintosh iBook is dead. Her hard drive is gone. It had been going 'Ronni Bennett dying computer wonky' recently. It was a hard drive failure. How could she have known? I guess you could go into your system utilities folder and check the health of your hard drive, but turning the computer on and off seemed to fix any problems my mom had been recently having. Maybe that on and off trick isn't the best solution. As a matter of fact, now that I think about it, she'd been talkign to Apple support a lot recently, and getting the turn it off and back on advice. Hmm. The good news is that it looks like she's going to be able to go into the local Apple Store and swap it out. She doesn't want to go over to the Apple Store now since it's dinner time, and tomorrow she's busy, and has other things planned for Sunday. Hope fully she'll be blogging again next week. She's got a new post on her mind entitled, "I Found It." Today has been a rainy day, a perfect day to go through some old photographs in anticipation of a very exciting collage workshop that will take place in a few weeks here at my development. This workshop is being offered to the community by NORC, "Naturally Occuring Retirment Community" and is supported by The Cora and John Davis Foundation & New England Baptist Hospital. "This is an opportunity to reflect on our lives and our loved ones. We will elicit recollections and acknowledge the values of past memories, deep relationships and life experiences." We have been requested to bring in photograhs and other mementos to the first class. I have many more albums to go through, so far I have pulled out pictures of my parents, Steve when he was a youngster and some more recent pictures. It's a good thing that I started doing this today as I can see that I will have to zero in on just what I want to emphasis. These classes tie in so perfectly with what I do as a blogger. When I think back at what my posts consist of, they are mainly about what is happening in my life today. Occasionally I make a post about something from my childhood, as I did recently, and find there is a great deal of interest. The first three hour class will be held on May 23. I can hardly wait!! Frank Paynter of Listics was a guest this week during Ronni's househunting in Maine. His series about childhood, youth and aging got me thinking about something that happened when I was about ten years old. 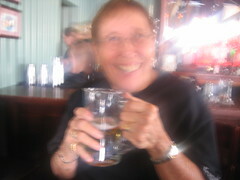 My Aunt Mary was a jolly, outgoing and lovable person. It was always fun spending time with her, she just had a way about her that was a pleasure. If it weren't for Aunt Mary I would not have any picutres of myself, my parents when they were young or my childhood friends. She was the only family member that had a camera. There were special occasions in my growing up years where we had a professional photograher take a picture of me, one on a pony and one as as flower girl at my aunt's wedding. Today the kids have their pictures taken the minute they are born! On one of my Aunt's visits we were sitting around the kitchen table and I mentioned the fact that I was having a problem at school, it must have been pretty bad for me to have said anything but since my Aunt was such an understanding person I felt I could talk to her. I was shocked and hurt at how she responded to me. "Your problem is nothing compared to the troubles I am having!" I can just see myself sitting there at the table, I couldn't believe her reply. I was just a kid and had no understanding about grown-up problems. A few years later I became aware that my Aunt's marriage was in trouble and that she was seriouly ill. She died at a young age. Every stage of life is a learning experience and we just have to keep learning.